After 640+ weekends, this is ABC’s last day on air. Yesterday, all but one programme came from ABC themselves. Today is the exact opposite, being mostly handed over to ATV except for the Weekend Sport, the film and the final ‘goodbye’ programme. They come on air an hour earlier than usual, in order to catch Communion from the Lambeth Conference rather than going to a provincial church near to where Saturday’s football match had been played. As usual, after the Morning Service ends, the station – and the transmitters – go off air, allowing all involved to nip home (or to the pub) for Sunday lunch. We’re back on air for 2.10pm for adult education – barely – before heading off to Weekend Sport. In the winter this programme was called World of Soccer and, unsurprisingly, concentrated on football. There’s no football in July at this point in history, but the programme continues with a different name and different sports. Hours of broadcasting were limited by law at this point, but there were a couple of exceptions to this: religion, adult education and outside broadcasts (the latter restricted to 300 hours a year to stop the exception being misused for general entertainment). This means that the clock only starts ticking today at 3.20pm, despite around three hours of programmes already having been broadcast. Quite a catch for The Golden Shot to have got Sammy Davis Jr on one of his visits to the UK, helped by his London agents being The Grade Organisation. The final religious ‘closed period’ of ITV 1.0 is kicked off at 6.15pm with the Tree House Family. This is the same programme as the Tinga and Tucker Club but with Christianity hammered into it. 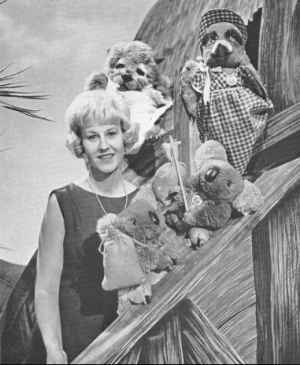 For viewers in the Midlands, Tinga and Tucker was therefore a six-days-a-week programme for kids with Jean Morton. For viewers outside of ATVLand, the Tree House Family was a once-a-week religious programme for kids with Jean Morton. The result was confusion whenever Midlanders and outsiders talk about the programme. A scoop for ATV at 6.35pm as Brian Connell gets to interview Michael Ramsey, the Archbishop of Canterbury, in amongst the 500 bishops, archbishops and metropolitans (there’s a joke there somewhere) at the Lambeth Conference. More from ATV at 8.25pm with the summertime replacement for the Palladium Show. A classic ATV variety bill here: a presenter who is big in the States but almost unknown in the UK introduces a cast of second-string and past-prime European stars singing and dancing on stage for an hour. The film at 9.25 and 10.25pm is the classic The Man Who Watched Trains Go By from 1952. Quite why ABC are promoting it as – shock horror – For Adults Only is an open question, as it was rated ‘A’ in 1952 and on its DVD release in 2008 got the modern equivalent rating: PG. The TVTimes says it’s “a nightmare of violence, desire and murder”. Nope, not even in 1952, let alone in 1968 or 2018. Braden… on the Box at 11.10 is undersold in the northern editions of the TVTimes. In London, it functions as ATV London’s last programme, a goodbye to weekends in the region that ATV have provided since 24 September 1955 and thus an analysis of the disappearance of ITV 1.0 and the beginning of ITV 2.0. In the north it’s billed merely as a return to TV for Braden that happens to be discussing television, with the only clue that it’s focussed on the changeover being the last sentence, left over in the editing from the London description. We close with Goodbye from ABC at 11.55. David Hamilton and Keith Martin are in the continuity studio in Didsbury. Down in Aston, Phillip Elsmore and Sheila Kennedy are reading roughly the same script for Midlands viewers. 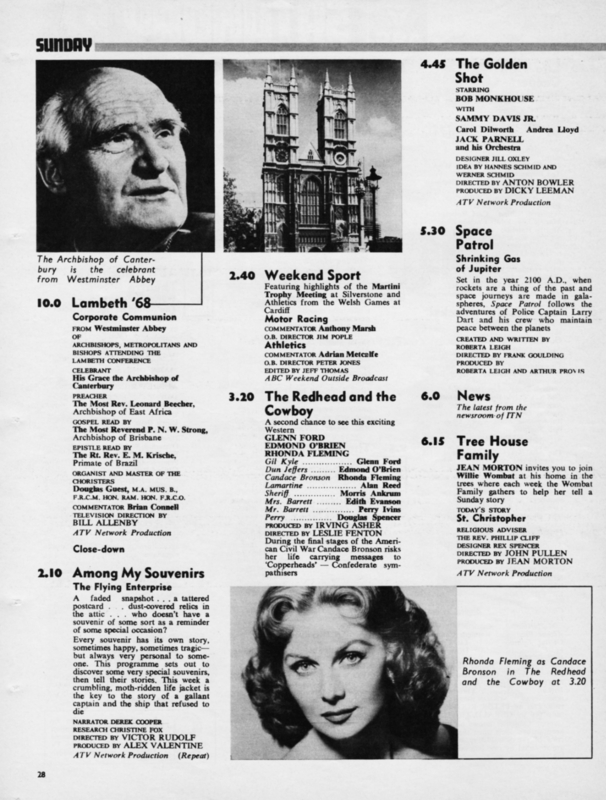 TVTimes gives a big billing to this programme; TVWorld in the Midlands, 50% owned by ABC, doesn’t, giving it all of three lines and leaving the changeover itself largely unremarked across the magazine. 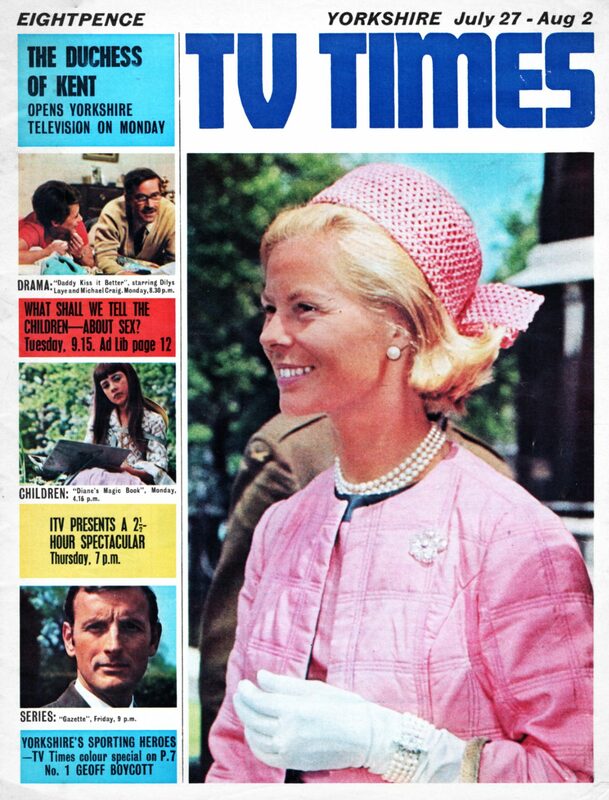 In TVTimes regions with contract changes, they had splashed big on the new companies and formats – Granada, Yorkshire and Thames/LWT. 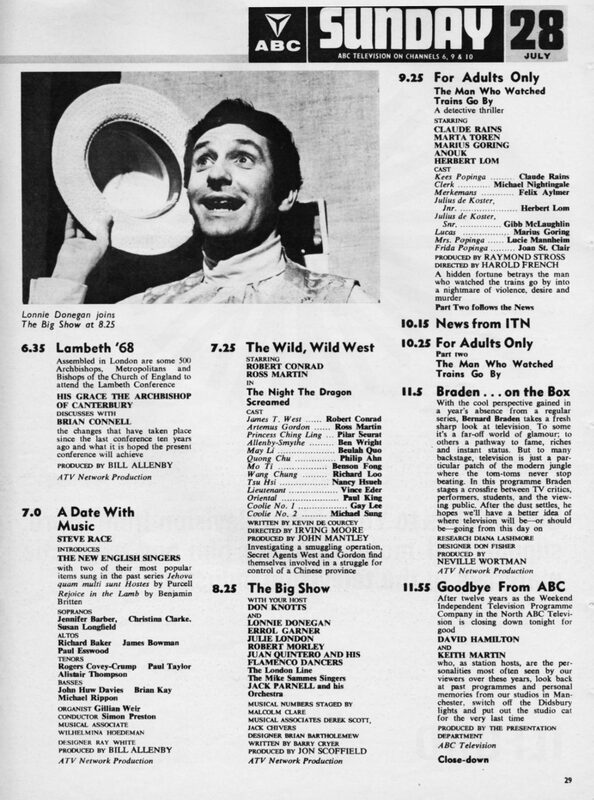 The programme itself shamelessly wallows in ABC nostalgia, majoring heavily on ABC’s early years. They show clips from many obscure programmes and happily show stills where said programmes have already been lost. 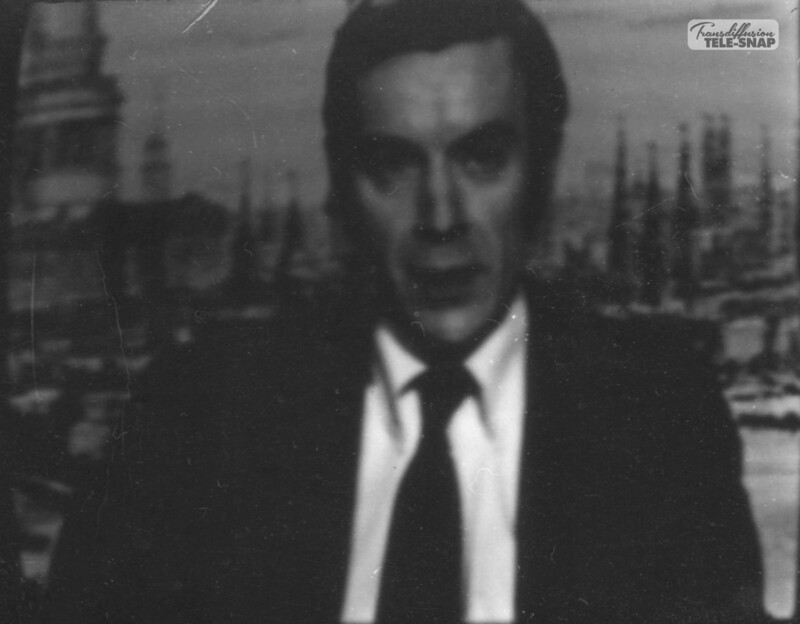 John Benson is absent from the northern version, despite being chief announcer, as he was already in London assisting Geoffrey Lugg with setting up the new presentation department of Thames. Also absent was John Edmunds, who had recently departed to join the BBC, but he was acknowledged as he had been a staff announcer for ABC for almost the whole life of the company. The northern edition talked of the Didsbury studios closing; in the Midlands, Alpha Television was continuing until nearer the launch of colour, under ATV management, so Elsmore and Kennedy thank the staff of the jointly owned facilities. The programme was prerecorded earlier in the evening on videotape, for the ease of providing the video and film clips and the stills, presumably, coming back live to the respective announcers for them to say a final goodbye at the end. Both programmes made a point of mentioning that ABC was becoming Thames and thus wasn’t disappearing completely: the same people would be making similar programmes in future. 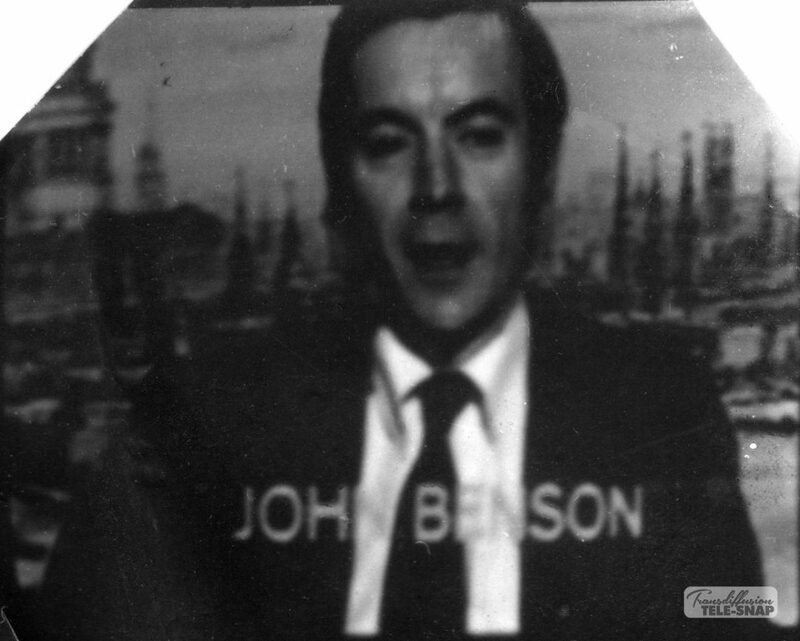 Two weeks before, John Benson had even popped up in the north to do some in-vision announcing with the new Thames Television backdrop behind him. ABC clearly saw Thames as their continuing presence in ITV!